Chapter 3: "The Hungry Storm"
Though few would call the Crown of the World hospitable, the PCs have no choice but to brave this icy frontier if they are to get Ameiko to Minkai. As they battle their way past the fell beasts that inhabit the arctic wasteland, the heroes must unravel the mystery of the supernatural blizzards that have been plaguing the polar icecap, ultimately confronting the dark and otherworldly force behind the treacherous gales. Will the adventurers survive the terrors of the Crown of the World long enough to remedy the curse that haunts it? Or will they succumb to the icy wastes, as have so many before them? "The Hungry Storm," a Pathfinder RPG adventure for 7th-level characters, by Jason Nelson. A look at the perils and hazards of the treacherous Crown of the World, by Jason Nelson. An exploration of Oda’s seedier side in the Pathfinder’s Journal, by Dave Gross. Four new monsters, by Jesse Benner, Jason Nelson, Patrick Renie, and Tork Shaw. 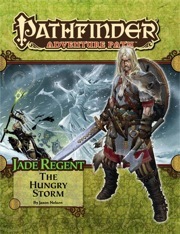 The Hungry Storm is sanctioned for use in Pathfinder Society Organized Play. The rules for running this Adventure Path and Chronicle sheet are available as a free download (532 KB zip/PDF). Very atmospheric arctic sandbox adventure! A great article on the arctic region of Golarion with cool maps. Very memorable locations like a strange tower near the North Pole or a seemingly empty village in the wilderness. Don´t use the Caravan rules - it will get destroyed. UGLY: You have to choose between 2 options of where to go occassionally and will never see the other location. This is a great adventure if you like arctic settings like "30 days of night" or "John Carpenter´s The Thing". It requires a GM that can work with the deadly sub-zero atmosphere and invoke a mood of lonlyness and "something is out there in the snowstorm". So after running this module I agreed with many of the complaints on it I had seen before. However, after some time to reflect on The Hungry Storm, I find myself recalling it more fondly than I had expected. There are some very good moments in this book, though there are also some not insignificant problems. First off, everything you've read about the caravan rules not working in this book are true. They just flat out do not, and the caravan will get rocked if you try to run as written. Thankfully, there are a lot of variant rules on the forums, and working with those I found it to be not so bad. Still, minus points on this since the caravan is a huge part of this book. A huge part should work, but alas. Despite the caravan problems, there are many cool and unique encounters in this book. The boss fights are very challenging and memorable, and the book really packs on the atmosphere if you let it. One complaint I've read is that this book doesn't tie in with the main story, and I think that's just fine. The main enemies of Jade Regent are a large organization, but not so large as to have minions stationed on 3 continents. It makes sense that they'd leave the desolate arctic wasteland alone. The article about the Crown is very well done, worth it if you want to run an arctic adventure. Lots of useful gear lists and adventure hooks. Overall, I'd give this 3 and a half stars, but since I cannot I will go with just a 3. If the caravan worked as intended I would make it a 4. The GM is going to have to do some legwork, but one can make a pretty solid adventure out of the framework here. I would recommend including Under Frozen Stars and The Baleful Coven as add-ons (they're from Legendary Games), as both enhance the book in their own ways. 1. A detailed overview of the arctic regions, compelling encounters (both combat and rp). 2. An interesting villain and arc to the journey. 1. I do not recommend running this is as. I made many adjustments as I went along to fit the party and garner player interest. 2. The villain is unrelated to the bigger plot. I made her one of the Amatatsu who died on the journey and is now an angry spirit being used by Sithud. 3. A lot should be cut out (as long as your handwaving xp points) so as not to drag. Overall, my group enjoyed this trek. I would recommend cribbing from Under Frozen Stars if you want to add a dosage of SF to the adventure. Going in, this was the portion of the adventure path I was least looking forward to the most. This is my first time GMing and choose not to use caravan encounters in my game made me dread this a bit. That being said, my players thought this was one of the more interesting, and enjoyable adventures so far. At first glance, this is a difficult adventure to run, and for the most part that holds true, but what is presented here is well thought out, and enjoyable. It just seems like it has very little to do with the ultimate goal of this adventure; confronting the Jade Regent. Overall, it was enjoyable, but anyone looking to run this adventure path will need to do a lot of prep work for this installment to make things make sense in your game. Announced! The cover is a mockup, and will change prior to publication. Yeah more monsters for every AP volume, this time five from the frozen waste. Oh and the adventure is cool(no pun intended) as well. I'll just have to look up all Vic's announcements today. So ... does this mean we'll see rules for weather and spells for weather manipulation that go beyond control weather and the random table in the GMG? Or does extensive actually mean longer than normal? An epic journey AP, and it ends in the "wild east"! I can't wait for this AP! And my group should finish up CotCT just as this issue comes out. I'm very curious how the other races (non human) will look/act in Tian Xia; are there Samurai elves/dwarves? Halfling ninjas? Do they look asian or are they still caucasian-looking? Oh, so many questions that I hope will be answered in the comming months! I'm supposing that the last three books will cover the actual campaign/adventures in Tian Xia, then? Becuase it seems like the first half is covering the whole trip there. Not that I'm complaining, as we'll be seeing lots of places I've long wanted to read more about in Golarion. The intent for Jade Regent was to basically have the first half be Tian Xia "visiting" other continents, and the second half be Inner Sea "visiting" Tian Xia (even if it only touches upon 3 nations in Tian Xia). "Along their journey, they learn that a monstrous entity is manipulating the blizzards and storms of the north, and unless she is defeated, the heroes may find themselves but the latest victim of the Hungry Storm." Take a caravan through the crown of the world they said, see Tian they said. I'd rather be sailing. "The intent for Jade Regent was to basically have the first half be Tian Xia "visiting" other continents, and the second half be Inner Sea "visiting" Tian Xia (even if it only touches upon 3 nations in Tian Xia)." That got my attention...any teaser as to which three nations? Minkai seems obvious, the other ones Hongal and Goka perhaps? And any clues when the proper Tian Xia supplements will be announced? Naw, then you'd be frozen dead *AND* drowned! And who wants that? Goka is hundreds, probably over a thousand, miles away from the closest point the PCs will reach in Jade Regent. The two other regions folks will visit in Jade Regent (region being a better word than "nation") are Hongal and the Forest of Spirits, which is itself a sizable wilderness. Got a question James, the elves seem to be almost everywhere (except the coldest climates), are there planned to be plenty of elves in Tian Xia? Really? Long way from Kyonin. Tian Xia is based on Asia, elves are often bound to Europe like locales and its myths. Can't we have something a bit different? Naga territory is interesting. Why not Asian mythic creatures and monster-races, and less of the beautiful western faerie-like elves with their longbows and their straight longswords. Elves, Orcs and Dwarves in Tian Xia in high numbers feels a bit off. Like an artificial spread-paste. Or to put it more elegantly, wouldn't it be better to focus on something new, rather than transplanting what has been done before (elves already being spread out across Avistan). And Kyonin is even FURTHER away from Sovyrian. I probably should have qualified that "yes" with a "There will be elves in Tian Xia, in the same way there are Tengus in the Inner Sea region, but that doesn't mean there'll be a LOT of elves, or even a lot of dwarves, halfings, half-orcs, gnomes, or half-elves." The elven region in Tian Xia actually has a really cool backstory, in any case, and is only one of 28 regions in Tian Xia—the majority of which are based on various real-world Asian cultures and mythologies. The elven region (and a couple other) regions in Tian Xia are specifically meant to be "bridges" with the Inner Sea region anyway, to make Tian Xia feel more like it's part of Golarion rather than floating in a void. You see some of these "creeper" nations in the Inner Sea region as well—Qadira and Jalmeray come to mind. In any event, the elves in Tian Xia aren't natives—they came there from somewhere else. I'll have more to say about this and ALL of Tian Xia after PaizoCon in any case... but until then, folks'll just have to trust me that if they like how we treated Europe and north Africa in the Inner Sea, they'll like how we'll be treating Asia in Tian Xia. It is, after all, the same folks building this part of Golarion. "...they learn that a monstrous entity is manipulating the blizzards and storms of the north, and unless she is defeated..."
Hrm. Wonder if this a certain legendary hag...but if it is, 7th level characters would have a helluva time putting her down...but I may be completey off here. Can't be ... James doesn't have the rules he wants for that, yet. Unless they're giving us a boatload of misdirection about where they are with over-20th rules. It's probably something more along the lines of the Mother of Oblivion. Not the same thing, but something similar. Maybe it's the scariest villain of my childhood, the WINTER WARLOCK!!! Well I didn't -think- you'd do that, but I sure was powerful skeered there for a moment. Although Baba Yaga is set to return to Golarion in 4713 (2013 for us), so I wouldn't be surprised to see her then. Maybe she is a Yuki-onna. Could be dragon78. As for fighting, might be best to try and push on, than fight the yuki-onna in her terrain. Guy on the cover looks cool. Cover and product description updated. A lot of cover art updates today and nice one as well. This issue appears to be light by one supporting article. Is the adventure/Crown of the World gazeteer going to be longer than usual? Woops, shoud've read the thread more closely. Thanks Joseph Wilson. I'm very excited for the Crown of the World gazetteer. With this and the Dragon Empires book in November, that's two new continents opened up for exploration in two months! The teases about the Varki people in Jade Regent 2 have really whetted my appetite for more. Finally an Adventure Path that is "somewhat" Linnorm Kingdoms themed!! Gypsies, Vikings, and Samurai! Oh my! She is somewhat related to the Crown of the World. Correct me if I am wrong but I believed it was her that marched from the Crown with a massive army of baddies to conquer half of the Linnorm Kingdoms, which is how Irrisen came to be. That's what sold me, I have been waiting for *something* Linnorm Kingdoms/Ulfen'ish in their AP product lines. Any way of putting that review in the chat discussion or at least getting it out of the review section? It's more appropriate for the chat discussion. That really bothers me when anyone puts a question like that in the reviews. The guy who wrote one of the monsters in the Bestiary. I cast Icetitankainen's reminder of subscription shipment. Cover looks amazing - any chance of that Ulfen being a mini down the line? We recently juggled some of the logic for showing product availability for products available in the future, and the PDF for this volume fell through the cracks. Should be fixed now. any idea as to when it will the pdf will be available for subscribers. I can't remember when I got the one for vol 2. As soon as your subscription copy ships, you will receive your PDF. How much will this AP installment showcase the Crown of the World? Will their be future supplements to expand upon this region or is that the intended purpose of the Land of the Linnorm Kings? ...hoping LLK is just the tip of the awesomeness in store!! Without giving anything away, I can say that this entire adventure is about the Crown of the World, and the issue includes a double-sized article about adventuring on the Crown, including a literal gazetteer of settlements, landforms, waterways, etc., plus stuff on dealing with hazards and environmental stuff at the crown, like radically shifted night and day, insanely cold temperatures, etc. Sweet!! I love the setting and hope to use a lot of the information from the AP in my home game!! Good tidings with Vikings!! On a side note, I can see the scene now, a Viking goes out on Halloween night door to door," Pillage or treat!!"" I suspect this'll be Paizo's coolest adventure so far.